Friday night I went to see Arabia 3D at the Natural History Museum’s IMAX theater. I’ve seen IMAX, but never a 3D movie before (incidentally the IMAX I've seen was Journey to Mecca...what is it about the hajj and big screens? Oh wait, perhaps because it's awesome!). It took a minute for my eyes to get used to looking through the glasses and my brain to distinguish the 3D-ness of the images, but then I settled in and just enjoyed. 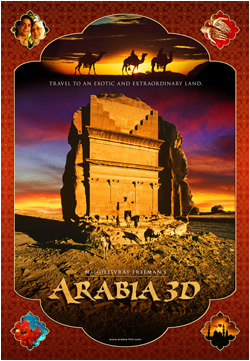 The movie was about the history and people of the Arabian Peninsula, from the ancients to modern day. But let’s be real here, the movie wasn’t about information or plot, it was about showing cool stuff in 3D! Once the format becomes more mainstream I think 3D movies are going to need plots...but for now the coolness factor seems to be enough. I was totally enthralled, thanks to the camels and ostriches jumping out at me, and the awesome images of the hajj to Mecca (when thousands of Muslim pilgrims circle the kabba 7 times). Saturday I went for a little run, read my book, and lazed around in preparation for going out. I swore off H street after the crazy-lady-tried-to-steal-Jess’s-pie incident…but I’m bored with Northwest DC, so late Saturday night I found myself making the very long trek to the Atlas District in Northeast. 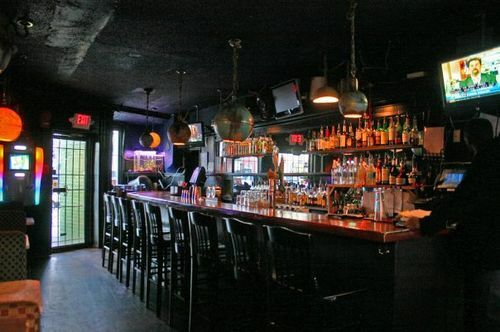 We went to dinner at Argonaut – my friend and I split a buffalo chicken wrap and sweet potato fries. It was very good, but nothing amazingly special. I really liked the restaurant though, we were seated in a small wood-paneled room (it would have been better for a date rather than a friends meet-up). The décor was interesting - the lamps were made out of old globes and there were framed maps all over the walls. From there we went from place to place, checking out all H street has to offer: The Pug (very chill), Fruit Bat (meh, we didn’t stay), H Street Country Club (good music), and Rock and Roll Hotel (really fun dancing!). The X2 bus got us back homewards safe and sound – it runs until 2:30 on Saturdays and drops off at Lafyette Square in front of the White House. Sunday was gorgeous and I just had to be outside. I left home at noon and meandered through Georgetown and Glover Park, meeting up briefly with LLC, then heading back home. That walk would have been enough, but then LOTR-Emily texted me: It’s beautiful out! Want to walk? Well…let me eat something, then I’ll be good to go. At 3pm, better fueled and happy to be out again, I embarked on walk #2. 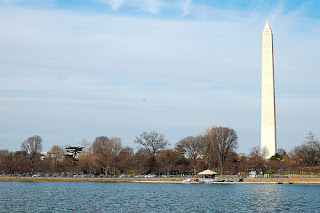 We walked the Mall, around the Tidal Basin, and back through Foggy Bottom. My day’s mileage totaled to 13 - no wonder I couldn’t bring myself to go to 6pm yoga! I watched more of the Oscars than I ever had before…but still only made it to 10:30 pm. The only nominated movies I’ve seen were Inception and Black Swan (click on them for my reviews), but I really really want to see The King’s Speech! Hope you had a good weekend too! How far did you walk?